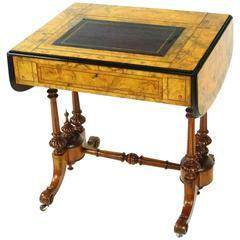 This is a beautiful bespoke burr walnut kidney desk in superb Victorian style and of simple yet elegant design. The desk is finished all round so it is freestanding. The desktop has an exquisite inset faded brown gold tooled leather writing surface for that luxurious finish. It is made from burr walnut which is valued for the beautiful grain of the wood, the drawer linings are crafted from solid oak and it has elegant brass drop handles. This stunning desk will create a sense of style in your home or office and will receive the maximum amount of attention wherever it is placed. Condition: In excellent condition, please see photos for confirmation of condition. Dimensions in cm: Height 77 x width 161 x depth 80 Height 61 x width 65 - Kneehole dimensions Dimension in inches: Height 2 feet, 6 inches x width 5 feet, 3 inches x depth 2 feet, 7 inches Height 2 feet, 0 inches x width 2 feet, 2 inches - kneehole dimensions Burr Walnut refers to the swirling figure present in nearly all walnut when cut and polished, and especially in the wood taken from the base of the tree where it joins the roots. However the true burr is a rare growth on the tree where hundreds of tiny branches have started to grow. Burr walnut produces some of the most complex and beautiful figuring you can find.